Check your Snow Blower Auger Parts every Winter. If there are any cracks, bends, or breaks on the auger or impeller assembly, replace them immediately, so your snow blower can clear snow efficiently again. Single stage snow blowers require rubber auger paddles or blades to collect and throw snow. Two stage snow blowers use rotating metal auger blades(rakes) to cut through deeper snow and feed the impeller. 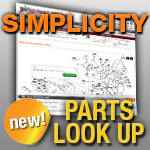 When you need snow blower parts, including auger blades, rubber auger paddles, and impellers, come to Jack's first. Our selection of auger parts fit a wide variety of Ariens, Honda, Husqvarna, Toro, and other manufacturer's snow blowers. Also, check out our snow blower DIY section for important information on snow blower maintenance and repairs.